Data Shredder literally destroys files, free space and your Recycle Bin contents instead of only deleting them. That means your data contents once overwritten and destroyed It can`t be recovered. The user therefore should be sure of the files, folders .etc. 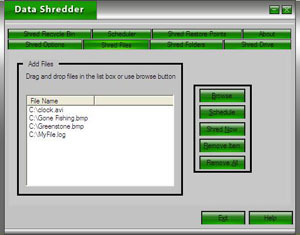 he/she wants to shred.There are many safeguards built into the Data Shredder program to warn the user.Windows allocates clusters for new files (and extending existing files) from one end of the disk and moving towards the other end. Accordingly, the user for example if deleting files near the end of the disk, it might be very long before those clusters get used again.Therefore, shredding a disk`s free space ensures that any deleted data stored in unallocated clusters will be completely shredded, and all the bits and pieces of left over data from deleted files will be destroyed.Generally speaking Windows stores files using two steps:A directory entry and A series of one or more clusters on a disk.When the user deletes a file using windows the file`s data doesn`t actually get deleted from disk. Windows simply marks the file`s clusters as available for reuse, then marks that file`s directory entry as deleted (from the directories available) by replacing the first character of the file`s name with a special character. Now if those clusters don`t get reused for another file, they are vulnerable and can be retrieved by those who know where and how to look for it.Adding one byte to the directory that was deleted will allow the retrieve of the entire file that has been deleted. 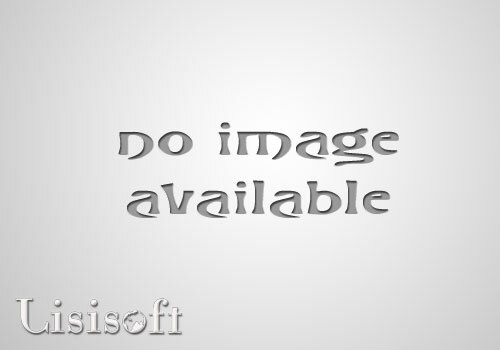 This is used in most of the "Unerase" utilities functions. Data Shredder makes it virtually impossible to retrieve data from a file because it literally overwrites the file`s data clusters before deleting the file. A "quick" shred overwrites the file once, filling its data clusters with zeroes. A "Thorough" shred overwrites the file maximum 10 times, using varying bit patterns each time.